Here are instructions on automatically adding payments to your student's account. 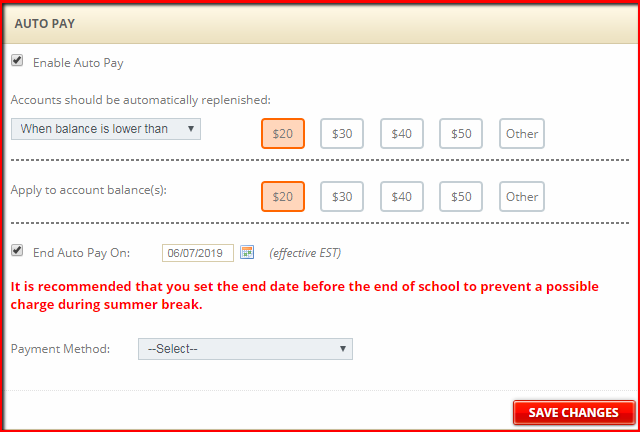 Our site can automatically add funds from your bank account or credit card to your student's account when his or her balance falls below a specified threshold. Before setting up auto pay, you will need to make sure that you already have payment information stored on our site. For help with saving bank account or credit card information, click here. 2 - Navigate to the Auto Pay section (pictured below). 3 - Check the Enable Auto Pay button. This will display the auto pay options. 4 - Enter the threshold at which the auto pay feature will trigger. If the account balance falls below the amount specified here, an automated payment will be made. You may choose either $20, $30, $40, or $50, or you may choose a custom amount by entering it in the Other field. 5 - Choose the amount of money to be applied to the account balance when the auto pay feature is triggered. Again, you may choose either $20, $30, $40, or $50, or you may choose a custom amount by entering it in the Other field. 6 - Set the date on which you would like the auto pay function to end. We recommend setting an end date which falls before the last day of school. However, you may choose to not end the function automatically. 7 - Select your Payment Method from the drop down menu. 8 - Click Save Changes.